Invincibility is a common trope in comic stories but there are not a lot of stories that deal with Immortality and the effect it can have mentally on the said individual. In a way, it is understandable considering that it will have to be handled delicately and expertly and there is a lot of room to fail. Ajin takes up Immortality, pits immortal people against a cruel, brutal and paranoid society and tries to analyze what this would do to an immortal’s psyche and the consequences that would come of it. Shortly after the world finds out about the existence of a few immortal “Ajin”, who regenerate and come back to life after being killed, they are branded dangerous and are hunted under the pretense of segregating these dangerous creatures from the normal ones. Once captured, these beings are then subjected to brutal experiments to try and find out how they actually regenerate and if it is possible to achieve similar effects for all humans. The story revolves around Kei Nagai, a high school student in Japan, who finds out that he’s an immortal when he is hit by a truck. Per procedure, the government and the bounty hunters start hunting him and he escapes with the help of his childhood friend Kaito. While on the run, Nagai finds out that there is an escaped group of Ajin extremists headed by Sato who want to fight against the government and the government agency behind the inhumane experiments. You can guess where the story goes from here. Any good story needs a great villain to be memorable. Ajin has Sato, a player through and through who cares not about the ending but about the fight. To him, glory is not in the way the war is fought or in achieving success. To him it's all about the fight. The heat of the battle. He can not be predicted as there is nothing he won't do for the thrill of the fight and nothing he won't do when he is on it. Imagine a unstoppable, immortal, super soldier version of Joker. Yep. Sato is an absolute badass and the tight story telling only helps elevate his legend. I cannot remember such a compelling, simple (yet complex) character in recent times. Sometimes, less is more and the author understands it and utilizes it perfectly. Aside from the brilliant villain and the hero, there is no shortage for good characters: Tanaka (right hand man to Saito) an Ajin who was tortured extensively and wants vengeance on his tormentors, the idealistic Kaito, the naive Ko, shrewd Sokabe, Tosaki.... the list goes on. The main attraction of the manga, aside from the art, is the character development and the psychological aspect of the situation. One cannot fault the Ajin for any of the choices they make after being hunted, tortured, experimented on and killed repeatedly for months (or years on some cases. In such a situation it is not a question of if they will snap, but when). The story, on that regard, does not paint either side as good or bad. It's monsters vs monsters fighting for their own agendas in a cruel world where no one really cares about the situation. The author handles the plot as it should be handled: without any goofs, grim, graphic and unrelenting. Another thing I really appreciated is the fact that there is no moral grandstanding or agenda pushing of any kind (unlike western comics) even though the story is heavily reliant on the Ajins fighting for their right and freedom. The story gives you a glimpse of what they went through, leaves it at that and concentrates on what they do because of that. 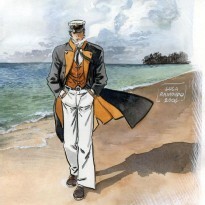 The story, characters and even the dialogs are very realistic on that regard and is very refreshing to read. In fact, the story tries to avoid any kind of trope as much as possible even down to the character level. Unlike most books, there is not much of a contrast between most of the characters. There is no good vs evil. The hero and the villain are not black and white. They are both very gray and their difference is only in the degree. If Sato is a monster who loves battle, then Kei is a cold, calculating, ruthless machine who will sacrifice anything and anyone to achieve what he wants. One can only wonder if the hero will have the same conviction and ideas as Tanaka or even Sato if he had gone through the same ordeal that either of them went through. That goes for most of the characters. They are not in the struggle for moral reasons. They have their own agenda, be it survival, career, power or fun. 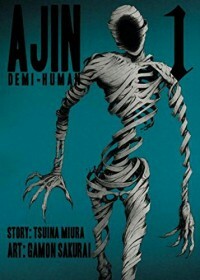 Ajin was a joint effort by Gamon Sakurai and Tsuina Miurna when it started. After about an year, Miurna left and Sakurai took the helm of the story. I was surprised to know that this was his first major story and all he has written before are short stories. I would be very interested to know how he takes this series further and his work thereafter. If his brilliant and insightful chapters "The real Kei Nagai, Blood relations, Fight and Call of Duty" are any indication, I have high hopes for this series. If you want a fast paced action story with excellent character development and psychological insight thrown in, give Ajin a try. You won't be disappointed.